Our Business Communications Center™ customer management software solution provides an intuitive user interface which allows Marketing, HR, and Legal departments to create campaigns, messaging, and manage legal T&Cs without engaging IT for ongoing projects. Now, the design and delivery of transactional documents that serve as a vehicle for custom marketing and messaging are put in the hands of the stakeholders within the business. BCC™ is fueled by the data generated by any business software and works with legacy ERP, EMR, CRM systems, and current business software. BCC provides controlled access to protect the integrity of the document or form template. Developers simply define areas as “hot spots” for inserting images and rich text messaging. Witness the power of BCC by clicking here to watch a 7-minute video. See the power and ease of use that empowers companies to deliver rich and relevant information in the documents and forms generated every day. BCC allows companies to enhance transactional documents as an effective vehicle for relevant custom messaging targeted for customers, employees and partners. Now, IT can hand off production-ready forms and documents to business units so they can control the campaigns and regulatory messaging needed within any customer communications. Media-driven departments can test and preview their work in seconds and schedule the effective dates for the messaging. With BCC, documents and forms come to life, wasted white space becomes valuable real estate and any product or service being sold can trigger communications or messaging without making any changes to your business software or database. No other product gives you more control of your transactional documents and forms! A major benefit of Business Communications Management is the reduced demand on the Information Technology team. Non-IT departments can now run campaigns and improve product and services messaging using transactional business documents with any ERP, EMR or CRM software, independent of their IT department. Simple user-interface for non-IT users: BCC allows companies to easily provide relevant, data-driven communications to customers, employees, partners, and vendors quickly and easily without scripting or programing and eliminates the burden on IT. Specifically targeted ads can be placed in documents and forms based on their customer’s buying history, industry, region, and more without any changes to existing business software. Integration Without Modification™, Eclipse’s proprietary document technology, has delivered since 1992. 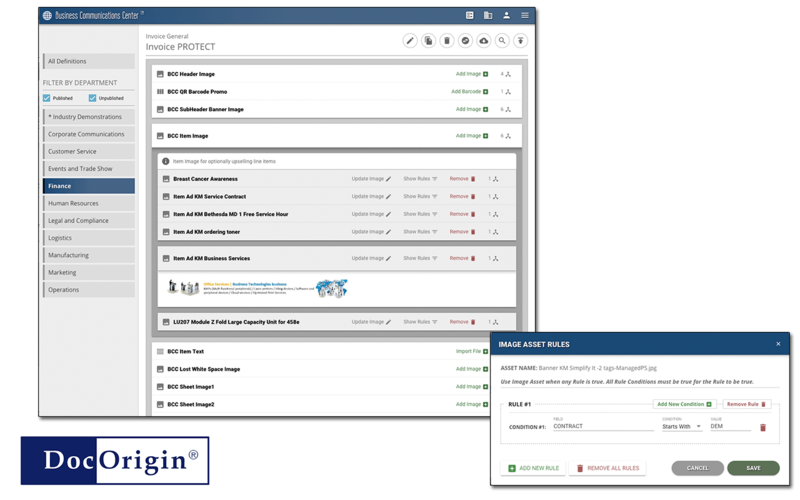 …how Business Communications Center (“BCC”) powered by DocOrigin allows Marketing, HR and Legal departments to create campaigns, messaging, and manage legal T&Cs without engaging IT for ongoing projects. See the control and ease of use that empowers companies to deliver rich and relevant information in the documents and forms they generate every day. Now, IT can hand off production-ready forms and documents to business units so they can control the campaigns. Wasted white space becomes valuable real estate to target advertising and messages to your customers. 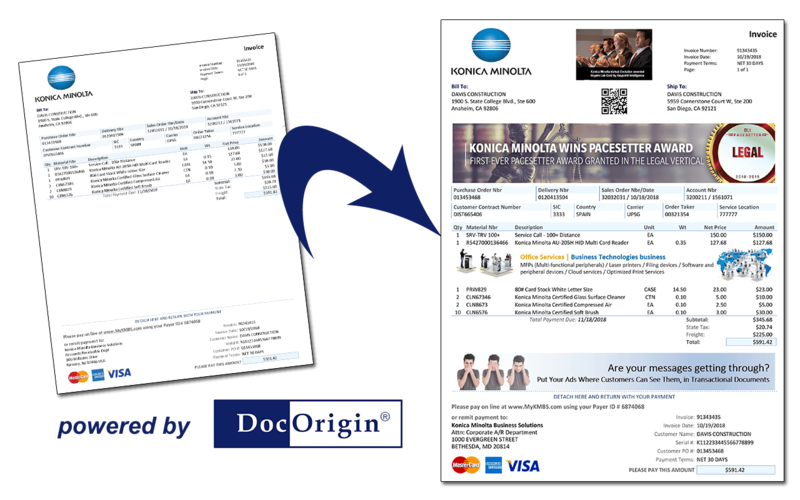 Put your customer documents to work for your company without changing your line of business software! 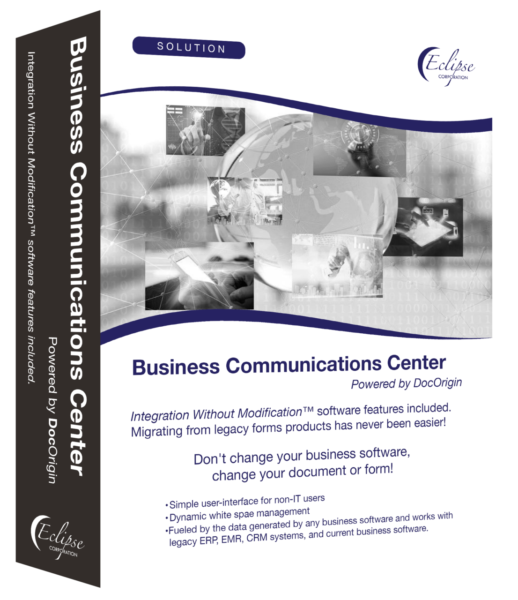 Download our brochure to learn more about Business Communications Center.